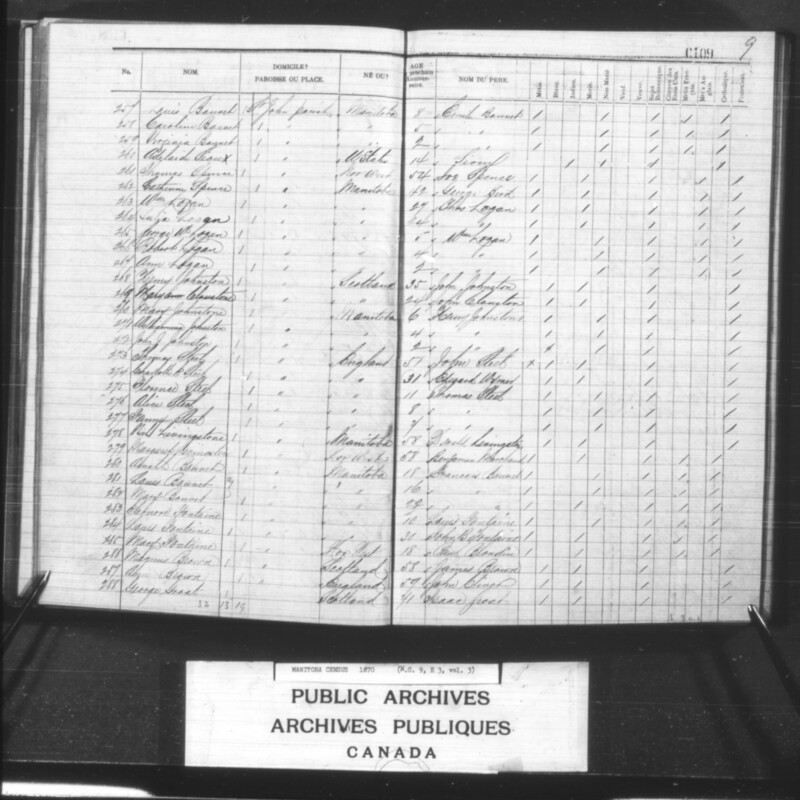 Residents of St. John’s Parish (excluding those in the Town of Winnipeg) in 1870, who were represented in the Legislative Assembly of Assiniboia by Hon. Andrew Graham Ballenden Bannatyne. Rev. John West (Anglican, a Member of the Church Missionary Society) was hired as chaplain to the Hudson’s Bay Company [HBC] in 1820. That year he established a mission on the west bank of the Red River, a mile north of HBC Fort Douglas, next to a creek that became known as ‘Parsonage Creek.’ Work began on building a small wooden schoolhouse and a church building of frame and log construction in 1821. The project, which established the parish, was finally completed in 1822/ 1823. After the flood of 1826, a replacement church designed by Rev. William Cochran and built of stone was completed in 1833. The Rt. Rev. David Anderson, the first Bishop of Rupert’s Land arrived in 1849, and, in 1853, St. John’s Church was re-designated St. John’s Cathedral. It in turn was replaced by a new stone building, begun in 1856 and completed in 1862. (The final and current stone cathedral was built in 1926 and expanded in 1959). 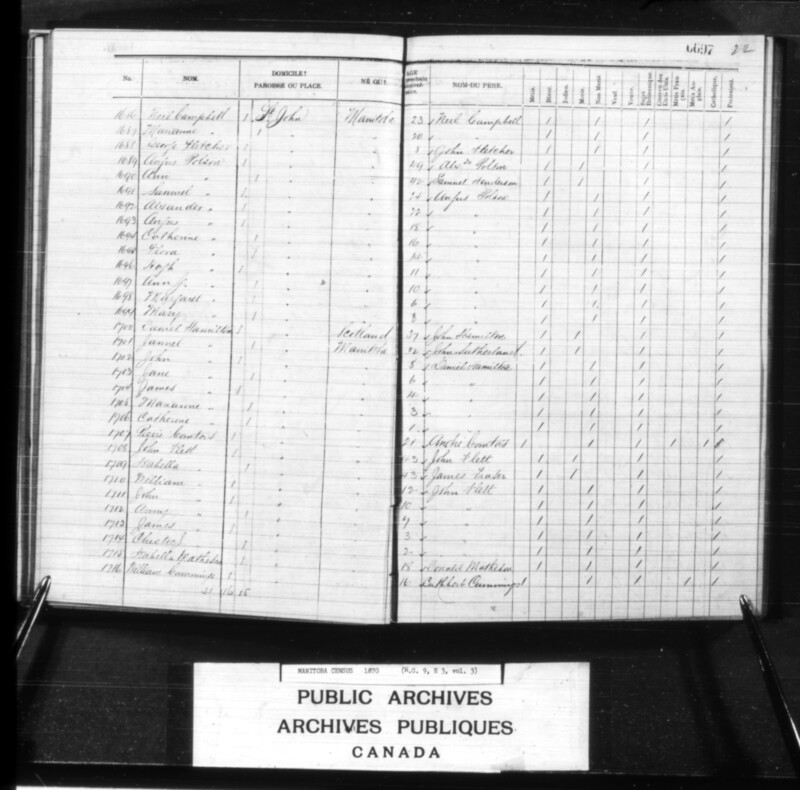 The Archibald census of 1870 indicated there were 417 people of the parish who professed to be Protestant (whether Anglican, Presbyterian, or Methodist) and 17 who professed to be Catholic (marked as ‘RC’ below). The electoral boundaries of the parish during late February 1870 differed from those used for conducting the census beginning in October 1870. This list is therefore a first step in reconstructing the electorate during the Resistance — pending further research. – [328-332] Alexander 31, Jane 24, Samuel 19, Jeannet 17, Margaret 5. – [334-340] Mary J. 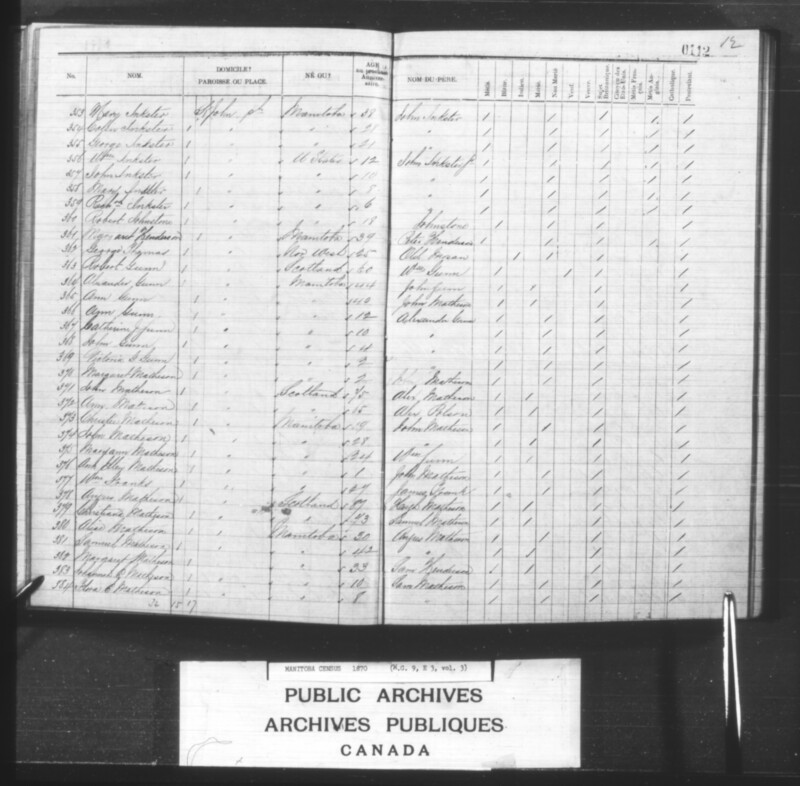 14, John H. 12, Harriet L. 10, Ellen A. 8, Florence 6, Agnes 4, Alfred 2. – [344-345] John 25, Jane 22. – [348-350] Mary J. 10, William T. 7, Catherine 3. – [353-355] Mary ‘Marak’ 38, Colin 28, George 21. – [121-125] Louisa 12, Margaret 11, Richard 8, John 6, Anna 2. The couple ran a tailoring business. – [141-144] James Roderick 7, Mary Annabella 4, Alfred Curtis 3, George Henry 1. Dr. Bird was also associated with property known as Bird’s Hill in the parish of St. Paul’s/ Middlechurch/ Image Plain. The property in or near the Town of Winnipeg was probably the premises of his medical practice and the Coroner’s Office. – [366-369] Ann 12, Catherine J. 10, John 4, Victoria 2. William Cook took treaty with the St. Peter’s Band in 1871. 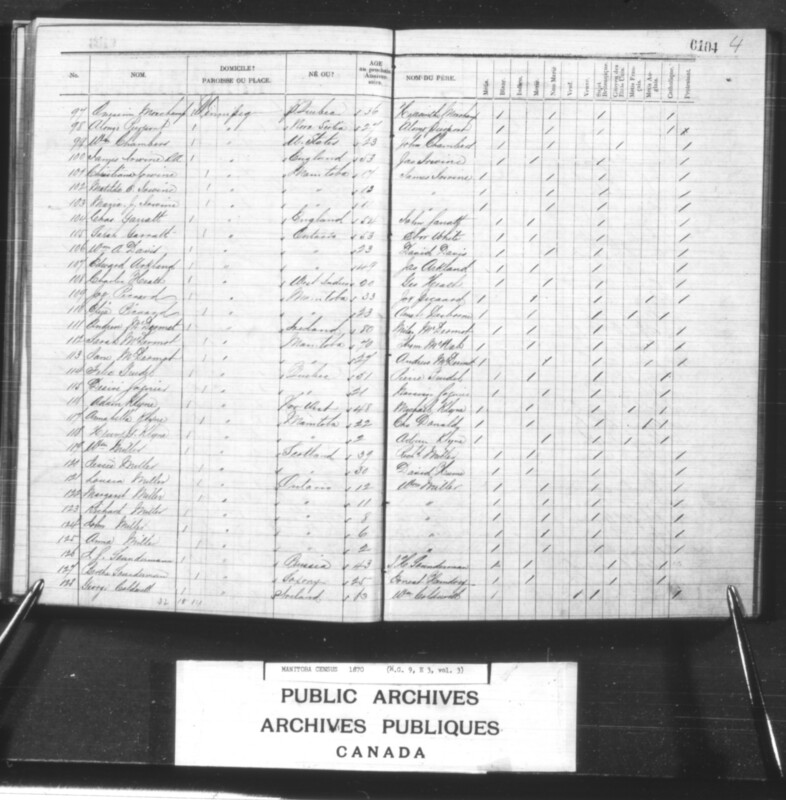 He was paid annuities for 3 persons from 1871 to 1876. 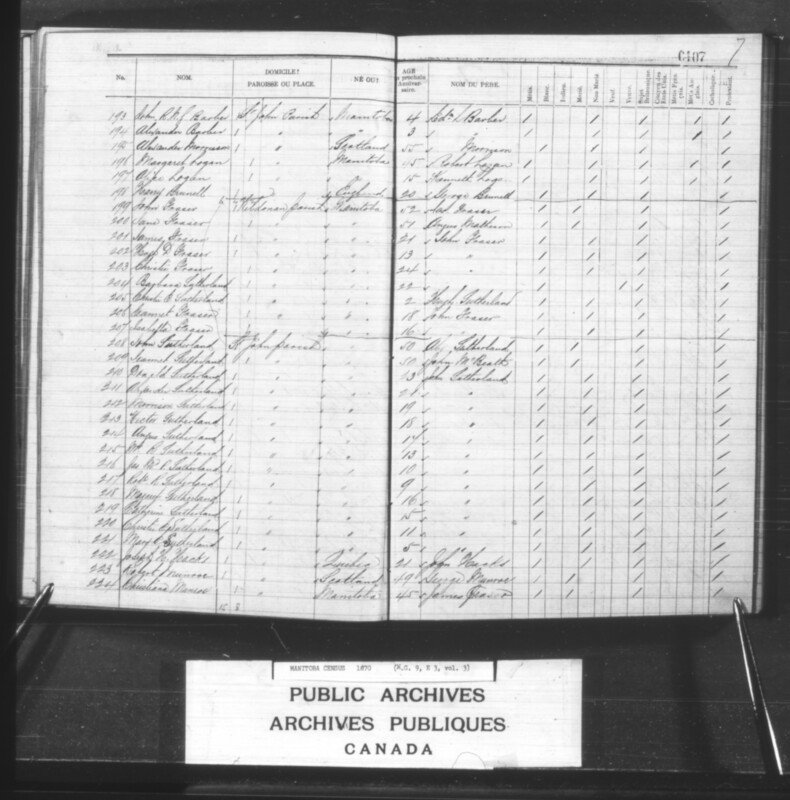 In 1877 he began receiving payments for 4 persons, having adopted a niece of Margaret Smith. In an affidavit of 1881, Margaret Smith described her husband as a farmer at St. John’s Parish. In 1882, “to once again obtain our franchise,” and in application for scrip, William Cook and his wife Margaret Smith paid the Department of Indian Affairs $100, refunding annuities he and his wife had received as members of the St. Peter’s Band (the adopted children remaining with the Band in treaty). William declared that he had never lived at St. Peter’s, but instead resided at St. John’s Parish. At first, the Department was uncertain as to what had become of the $100. The couple was granted discharge from treaty. William died shortly afterward. Scrip was issued in their names in 1886. Sheriff Colin Inkster, acting on behalf of Margaret Smith-Cook then raised the issue of whether the Cooks had ever owed any repayment of treaty annuities at all, given changes in legislation that exempted Métis people leaving treaty from the requirement of repayment. In 1886, the Department of Indian Affairs informed Inkster that no refund could be made. The case was still under discussion in 1991, but the same conclusion was arrived at. – [1764-1766] Hugh 17, Mary 15, William 12. – [1771-1777] James 14, Eliza 12, Roderick 10, Laura 8, William 6 Robert 3, Annie 1. 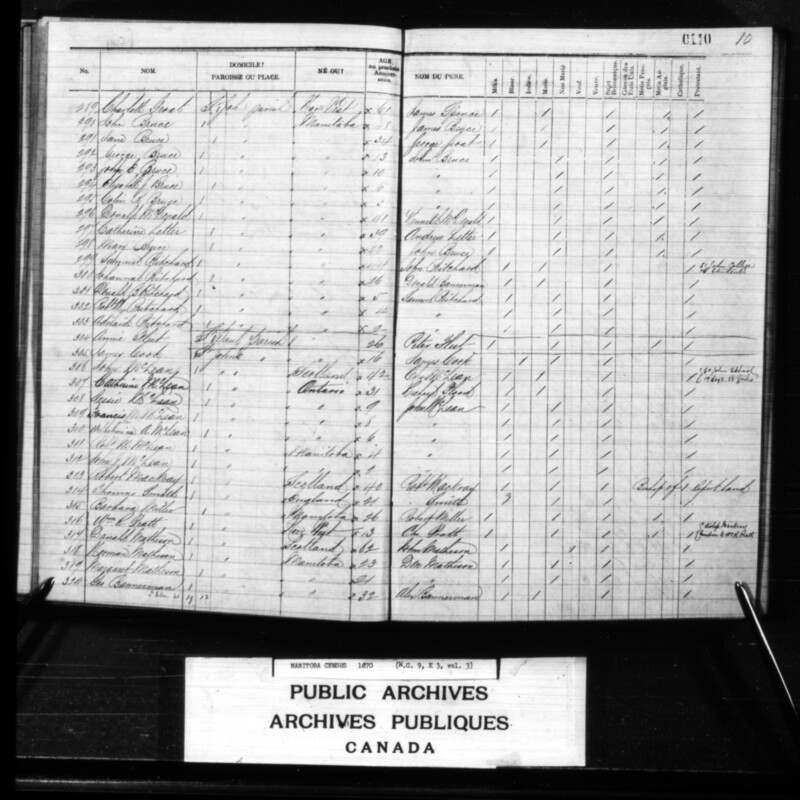 Annie McDermot Bannatyne was a younger sister of Mary Sarah ‘Sally’ McDermot, wife of HBC Governor William Mactavish, who resided with her family at Upper Fort Garry during 1869-1870. – [167-169] William R. 21, Alexander 19, Margaret 18. – [172-176] Louisa J. 12, Caroline S. 11, Herbert W. 10, Henrietta B. 8, James R. 6. – [180-181] Mary Isabel 8, George Alex 6. – [184-185] Mary Jane 5, Ann M 2. – [191-192] Harriet J. 8, Albert E. 6, [193-194] John R.N.J. 4, Alexander 3. – [201-203] Christie 24, James 21, [Jeannet 18, Isabella 16? ], Hugh D. 13. – [402-403] Ann 24, Mary 22, [400-401] Alexander 21, Samuel 19. – [413-416] George 32, Charles 30, Mary 28, Elizabeth 24, ( Ann 19 [listed as at St. John’s Parish]). – [210-221] Donald 23, Alexander 21, Morrison 19, Hector 18, Angus 17, Margaret 16, Catherine 15, William R. 13, Christie E. 11, James M.P. 10, Roderick R. 9, Mary E. 5. – [225-231] George 22, James 20, Donald 16, Alexander 14, Marion 12, Barbara 9, John W. 3. – [234-238] Catherine 14, Jeannet 12, Samuel B. 8, Adam W. 4, Victoria M. 1. – [247-249] Rachel 7, Benjamin 4, Albert 2. – [252-254] Mary 42, Jane S. 22, Kenneth 20. – [257-259] Louis 8, Caroline 5, Virginia 2. – [265-267] George W. 5, Robert 4, Ann 2. – [270-272] Mary 6, Williamiena 4, John J. 2. – [275-277] Florence 11, Alice 8, Fanny 7. – [280-282] Mary 22, Amable 18, Louis 16. 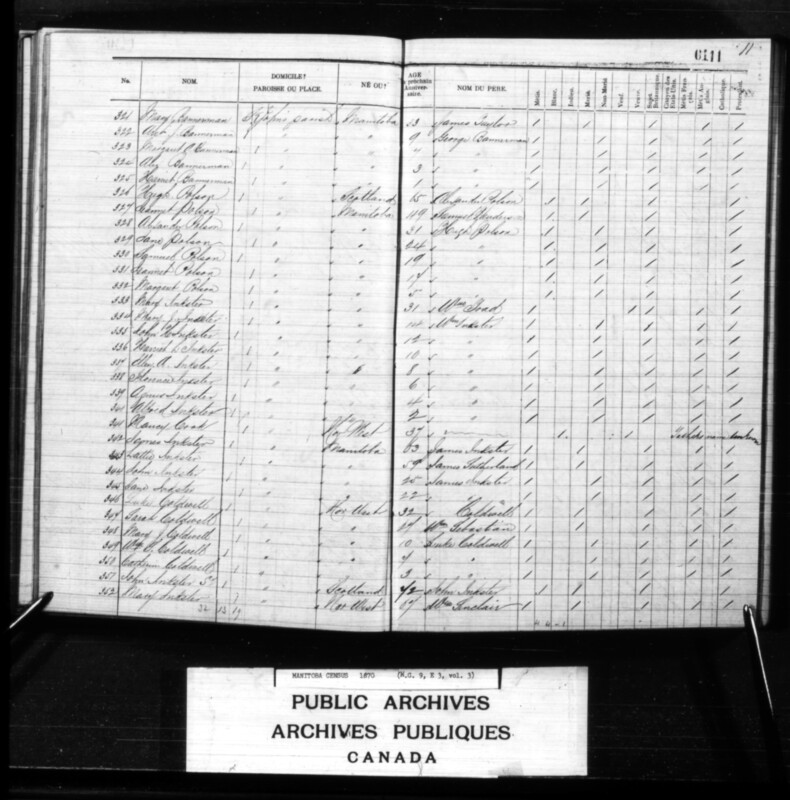 – [161-164] Charles W. 7, Laura M. 5, David H. 3, Leanora 2. – [1663-1664] Alexander 5, Angus 2. – [318-319] Norman 23, Margaret 21. – [1667-1670] Alexander 8, Anny 4, Esabella M. 3, John 2. 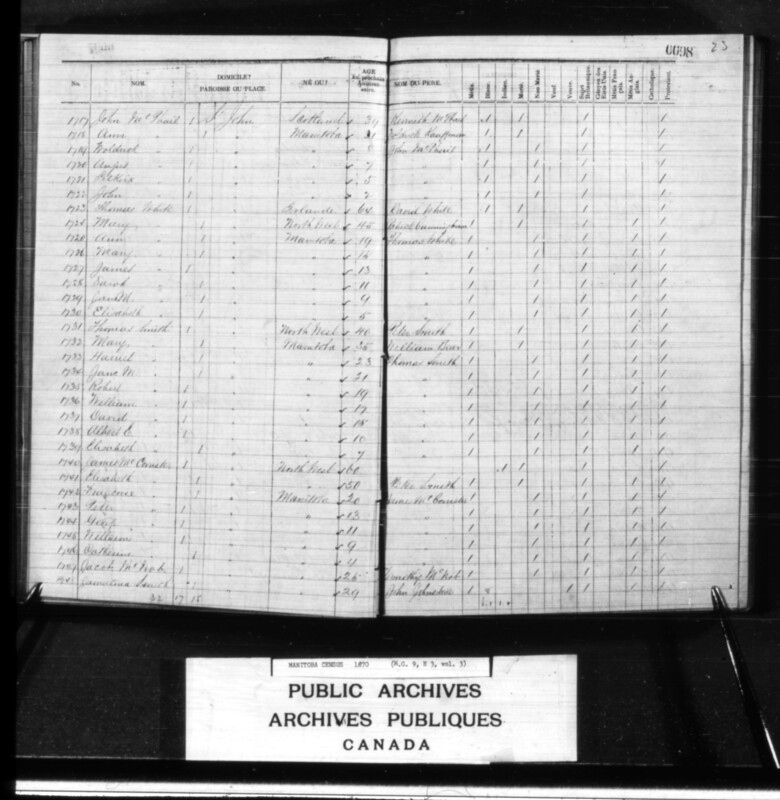 – [1673-1676] Ann 13, Jeannet 9, George 7, Barbara M. 5. – [1680-1685] John 13, George 12, Charles 10, William 8, Anny 5, Mary 3. – [1691-1699] Samuel 24, Alexander 22, Angus 18, Catherine 16, Flora 14, Hugh 11, Ann 10, Margaret 6, Mary 3. – [1702-1706] John 8, Jane 6, James 4, Marianne 3, Catherine 1. – [1710-1714] William 12, John 10, Anny 7, James 3, Christie J. 2. – [1719-1722] Wolduoh? 8, Angus 7, Selkirk 5, John 2. 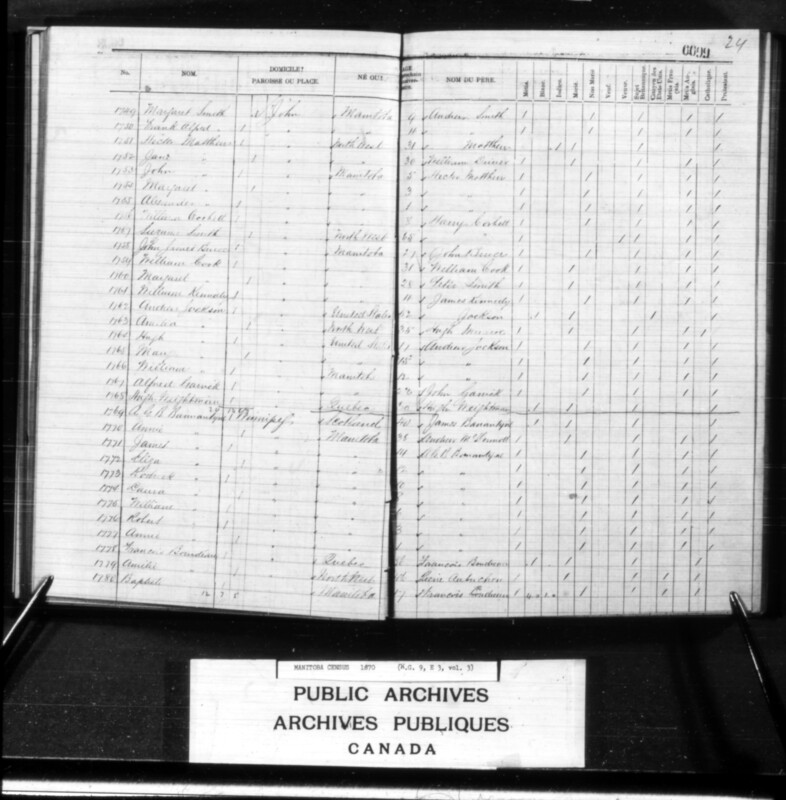 [296-297] Donald McDonald (Métis, born 1829/ 1835 to #3333 Kenneth McDonald and Elizabeth Calder) married Catherine Letter/ Setter (Métis, born 1831 to Andrew Letter/ Setter and an unidentified woman) and Ann Smith? – [308-312] Jessie 9, Francis M. 8, Wilhelmina A. 6, Robert 4, John J. 2. –  William R. Pratt 13. – [1725-1730] Ann 19, Mary 15, James 13, Sarah 11, Jane M. 9, Elizabeth 5. – [1742-1746] Francoise 20, Peter 13, George 11, William 9, Catherine 4. A James McCorrister Sr. was named as No. 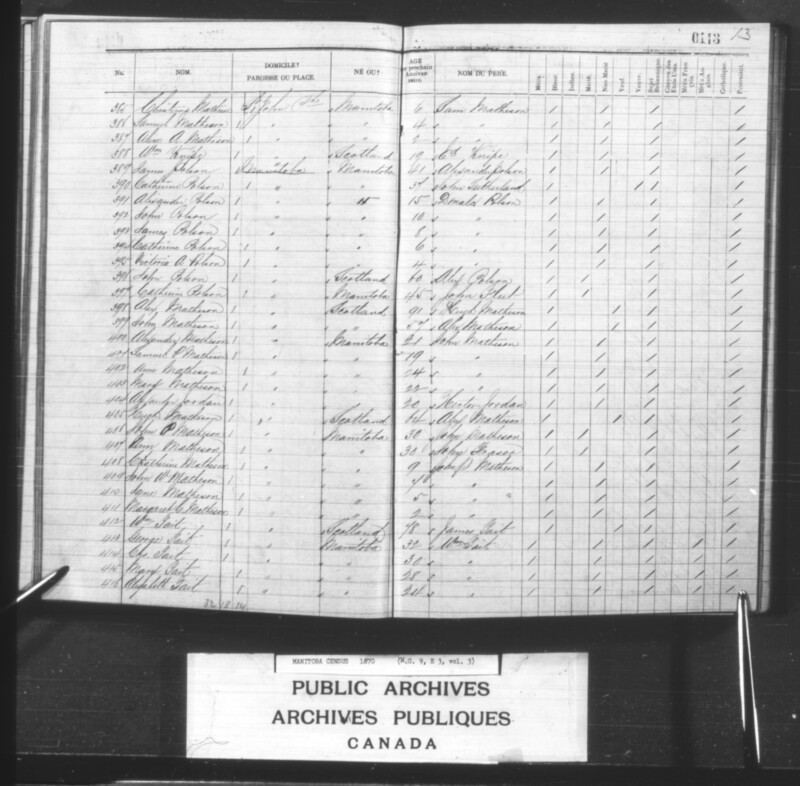 261 in the 1875 St. Peter’s Band Annuity Paylist, but no details were entered (absent?). 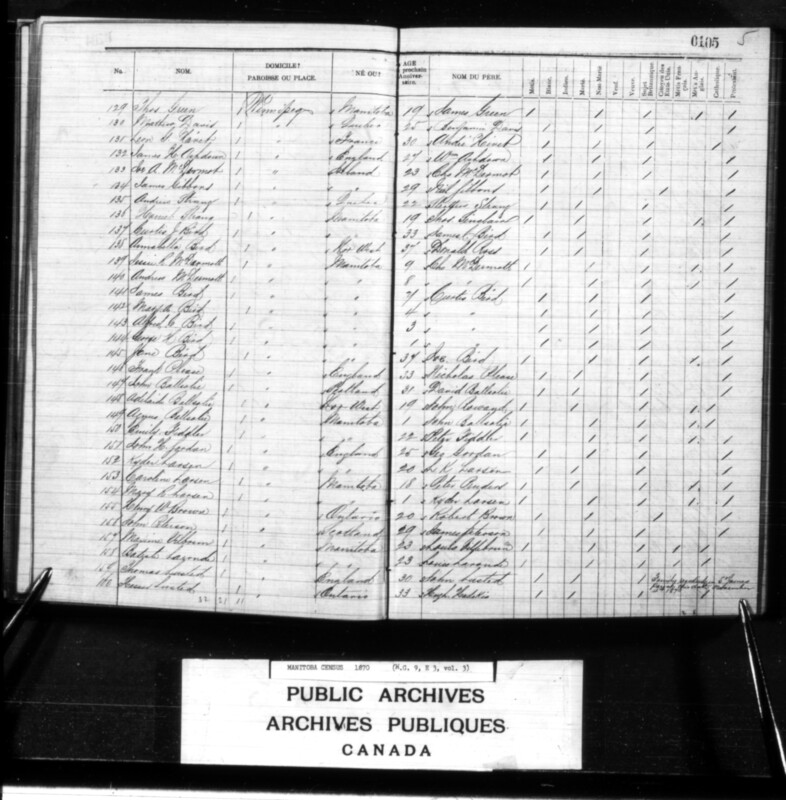 – [1749-1750] Margaret 9, Frank Albert 4 (children of Andrew Smith and Jamatima Johnston). – [1753-1755] John 5, Margaret 3, Alexander 1. –  Donald B. 5, Robert M.? [W.?] 4, Adelaide 2. 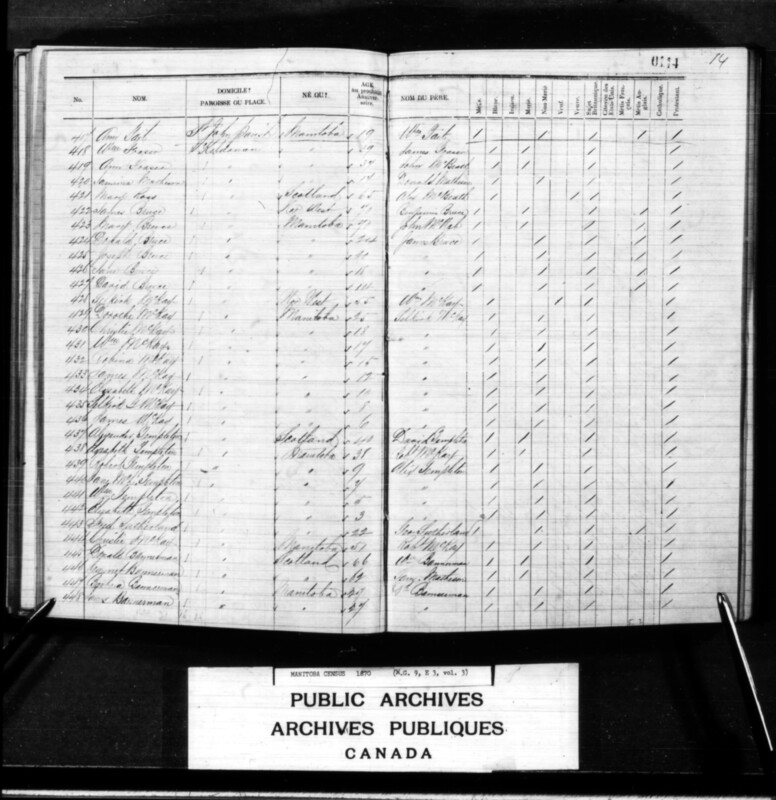 – [292-295] George 13, John E. 10, Elizabeth J. 6, Colin R. 3. – [322-325] Archibald J. 9, Margaret 7, Alex 3, Harriet 1. – [1724-1739] Harriet 23, Jane M. 21, Robert 19, William 17, David 15, Albert E. 10, Elizabeth 7. 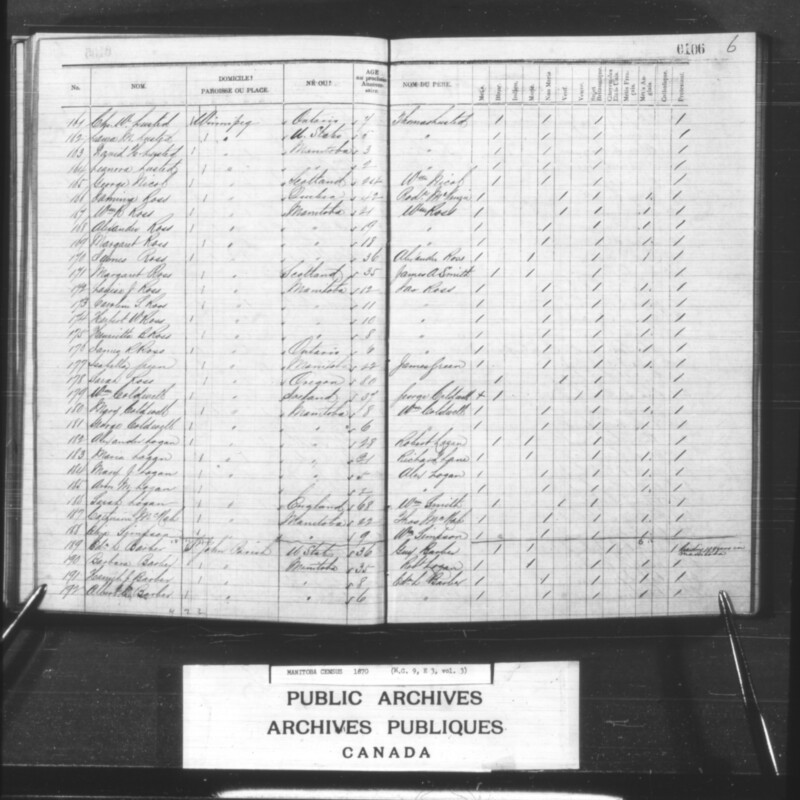 In a declaration of 1881, a David Smith of St. John’s described himself as a farmer. – [391-395] Alexander 15, John 10, James 8, Catherine 6, Victoria A. 4. – [383-384] Johannah 10, Flora 8, [385-387] Christiana 6, Samuel 4, Alice 2. 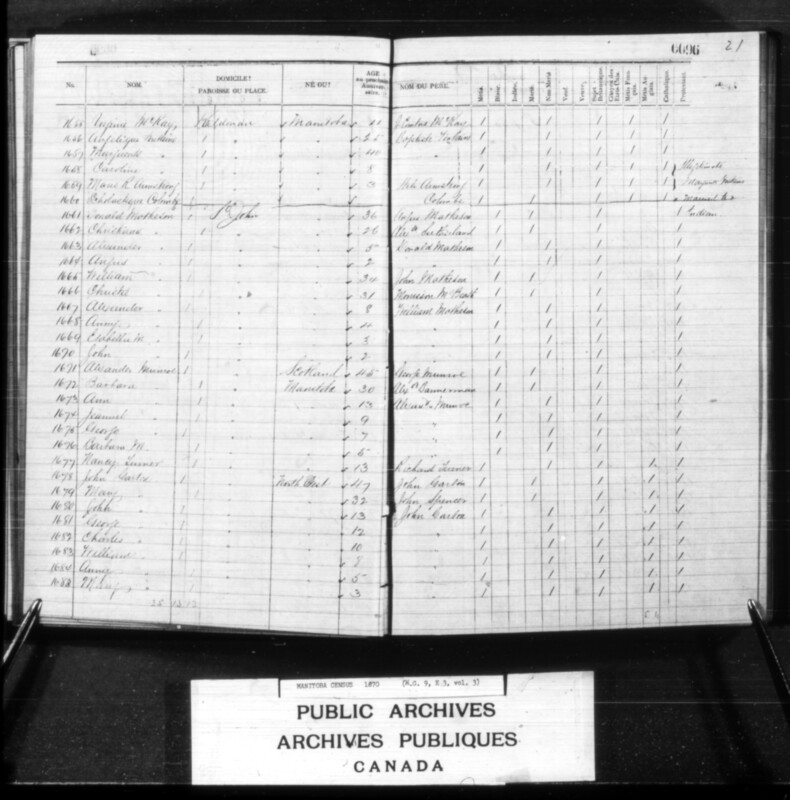 Perhaps someone can point me in the right direction – Where would I find church records of St. John for July 12, 1825. Specifically looking for a Marriage Certificate for William Robert Smith and Mary Ann Swain. As proof read the actual pages 182-183, following Alexander Logan; the tick box for metis is unchecked, as is the tick box for anglais metis further over. That is because Alexander Logan is the son of the English woman Sarah Ingrahm, Robert Logan’s second wife (also in this census in the same household). Thank you for catching the transcription error Lilah. The entry will be updated. The first name of Larsen is Ryder, not Kyder. 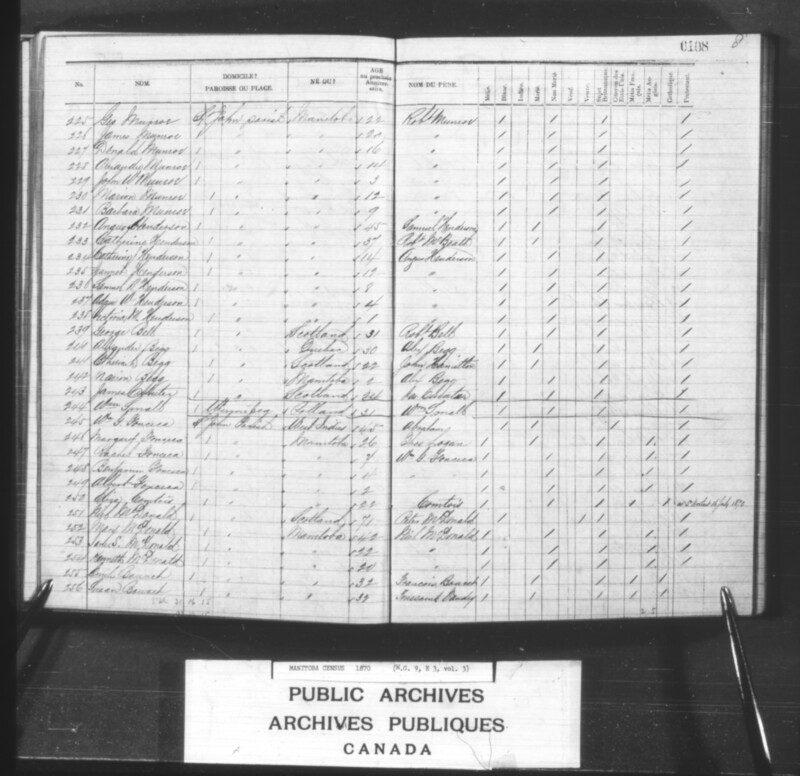 The top of the R is cut off on the census record, making it look like a K. The R is more visible where he is recorded as the father of daughter Mary R. Ryder Larsen operated a Red River Settlement photography studio and was a rather colourful figure. He is dittoed as being an Englander from the census entry above him but actually he was born in Norway of Norwegian parents. Many thanks Lyle, the entry has been corrected to reflect your comment info. Thanks Sandra, I’ve updated the entry — though all I’ve been able to find as a wife for George Bird is Ann ‘Nancy’ Thomas. Do you have a source for a wife named Catherine?